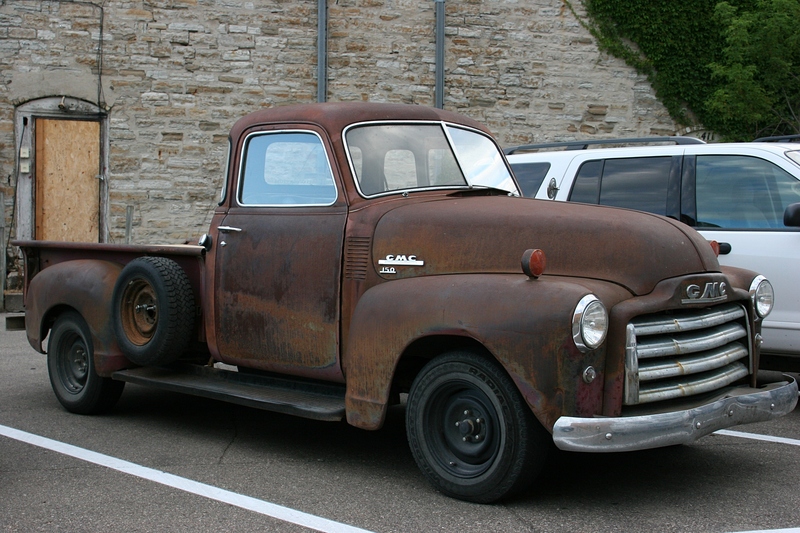 A GMC 150 parked in a city lot in historic downtown Faribault. Minnesota Prairie Roots file photo July 2015. GROWING UP ON A FARM, I never truly appreciated pick-up trucks. They were simply a part of farm life—the workhorse of the farmer. The truck needs a lot of work, but it has potential. Minnesota Prairie Roots file photo July 2015. In the bed of his red and white Chevy pick-up, my dad tossed fence posts, seedcorn bags, chains, shovels, and a myriad of other agricultural essentials. He may even have transported an animal or two. 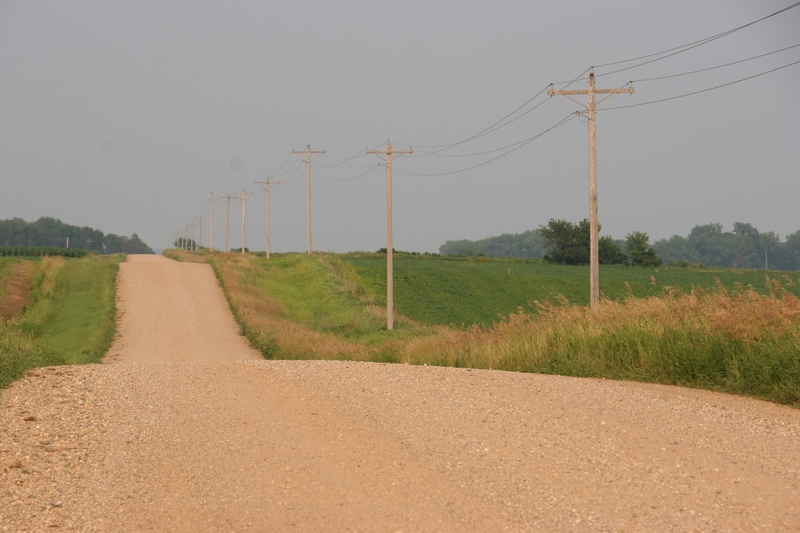 I recall flying along gravel roads in the front seat of the pick-up, and sometimes in the bed, dust trailing a cloud across the prairie. Other times Dad would bump his truck across the stubbled alfalfa field. 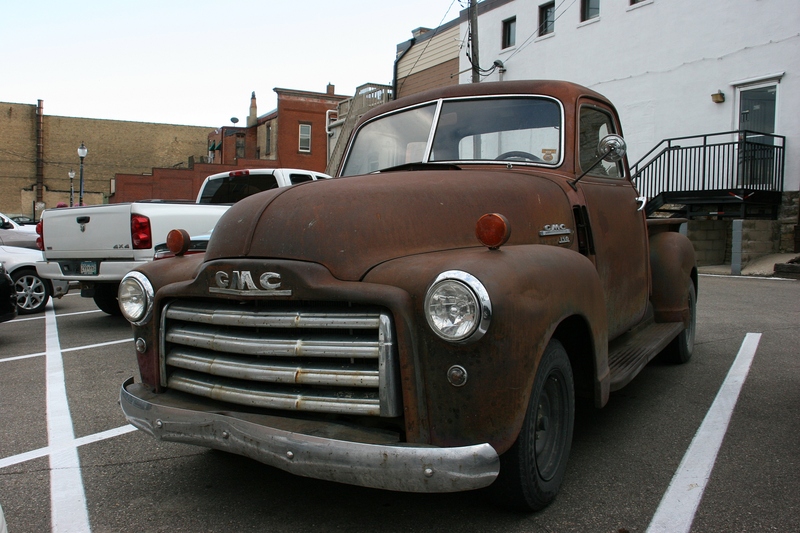 Every time I spot an aged pick-up truck, I covet it. Not because I necessarily desire ownership. Rather, it’s about reliving, and holding onto, those rural memories. 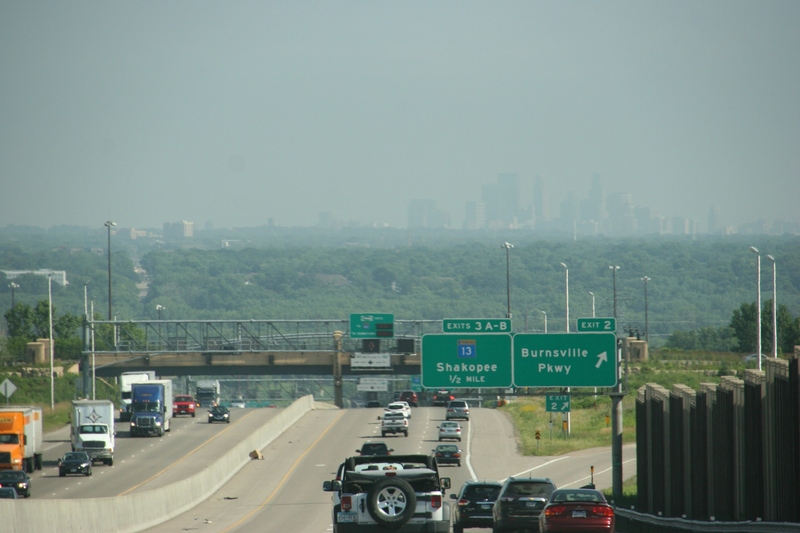 The Minneapolis skyline as photographed from Interstate 35 in Burnsville. Minnesota Prairie Roots file photo, June 2015. MINNESOTA HAS LONG been divided. Rural vs. urban. 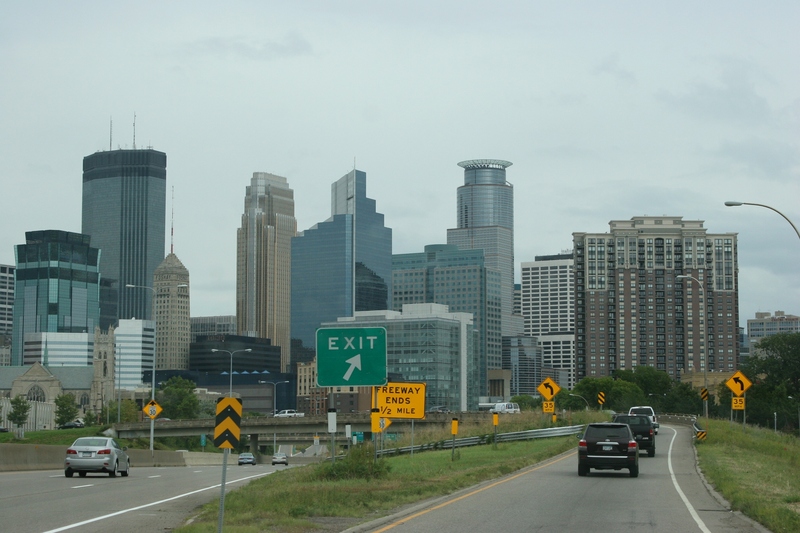 The area outside the Twin Cities metro is often referred to as Greater Minnesota or Outstate Minnesota. I don’t mind the “greater.” But outstate? Isn’t every inch of land, every single one of our 87 counties, part of the state of Minnesota? The division of urban and rural is always most noticeable during the legislative session. Or during road construction season. Silos mark the rural skyline on a farm in the Prior Lake area. Minnesota Prairie Roots file photo. Despite our division and differences, we are still Minnesotans. And whether you like the busyness of the city or the quiet of the country, or something in between, you can find your right place in the diverse geography of our state. Just north of Lamberton, Minnesota, in Redwood County, the county in which I was born. Minnesota Prairie Roots file photo. Follow prairie to the Dakotas and hills to Wisconsin. Angle lakes and canoe winding rivers. Secret yourself away in woods or free your spirit under wide skies. Choose an office cubicle or a tractor cab to box you in. Meander along gravel roads or rush along the interstate. The downtown Minneapolis skyline, up close. Minnesota Prairie Roots file photo. Whatever your preferred skyline, embrace it. Urban isn’t better than rural and rural isn’t better than urban. Not in the sense of a grand, broad statement. But from a personal perspective, we have our preferences. And that is good. Our state needs balance. And we should respect that. Margie Brown Holland and her unborn daughter, Olivia, were honored at The Clothesline Project display this summer in Owatonna. Margie is the daughter of my former neighbor Ron. The Minnesota Coalition for Battered Women coordinates the project to honor victims of domestic violence. Redeemer Lutheran Church brought the project to Owatonna. JUST OFF THE TOP of my head, I can think of perhaps 20 family, friends and indirect acquaintances who have been victims of domestic abuse/violence. Nearly all survived; some did not. Dan Kasper. Photo courtesy of Redeemer Lutheran Church/Dan Kasper. On Sunday afternoon, January 31, Dan Kasper of Northfield will talk at a church in Owatonna about his daughter Becky, who was murdered in April 2013 by her ex-boyfriend. Dan’s personal story of “Finding hope in the midst of loss” is certain to make a powerful impact. Last week I spoke with Dan in a 90-minute phone conversation. I didn’t take notes to shape this blog post. I only listened. Another t-shirt from The Clothesline Project. And what I heard was the strength of a father determined to honor his 19-year-old daughter by sharing his experiences. I learned of the warning signs Dan and his wife missed, mostly because they live in Minnesota and Becky was far away attending college in Arizona. I heard a father who, even through the worst pain a parent can experience, has risen up to make a difference. I learned more about his precious Becky, how she was compassionate and caring and how she was trying to help her ex-boyfriend work through issues. Dan would later meet, face-to-face, with her killer in prison. I heard a man of faith speaking to me. I heard the anguish of a man abandoned by some friends after Becky’s death, but also the recipient of unexpected support from others. I listened to a hard-working man from a small Midwestern college town tell me of the near financial ruin his family has faced since Becky’s death due to funeral costs, lost income, travel related expenses and more. His story is powerful. If you live anywhere near Owatonna, plan to attend this 2 p.m. Sunday, January 31, presentation at Redeemer Lutheran Church, 1054 Truman Avenue. We all need to be educated about domestic violence/abuse. And I can’t think of anyone, other than a victim, more poised to educate us than a father who has lost his daughter to domestic violence. FYI: Dan and Sheryl Kasper have established the non-profit Becky Kasper Foundation to honor their daughter. Click here for more information. If you are in an abusive relationship, seek help. You are so worth it. Contact a local crisis resource center or women’s shelter for help and support. If you are in immediate danger, call 911. Leaving an abuser is the most dangerous time; have a plan to leave safely. Statistics on a The Clothesline Project t-shirt. Click here to read my July 2015 blog post about The Clothesline Project. And click here to read the just-released Minnesota Coalition for Battered Women 2015 Femicide Report. Last year at least 34 people in Minnesota were killed due to domestic violence. IN THE YARD OF A CUTE craftsman style house at a busy intersection in Faribault, a patriotic snowman greets passersby. I pass by this sunny yellow home often. On my way to and from church. On my way to and from Minnesota State Highway 60. I don’t know who lives at 402 Division Street. But I appreciate the creativity of this snowman. Red and blue votive candles for buttons. American flags for arms. An American flag banner cinched around the snowman’s waist. Even red and blue dye for lips. This isn’t your average snowman or snowwoman, whichever it may be. Tell me about any creative snow people you’ve seen, even built. The Hoisington family’s 2016 snowman. FOR THE PAST THREE YEARS, I’ve photographed the over-sized snowmen sculpted in the Hoisington family’s yard in the heart of Faribault at 18 Third Avenue Northwest. This year I braved double digit below zero windchills on a bitterly cold Sunday afternoon to document a sculpture that brings me joy. A snowman hearkens to carefree days of childhood, when I actually loved winter. It brings memories of laboring with my siblings to roll snow into monumental balls. Three snowballs stacked atop each other to build our version of Frosty. Snowmen and snow days. Snowdrifts hard as granite. Snow bucked into piles by Dad behind the John Deere tractor and loader. Imaginary mountains upon which we raced as Canadian Mounties. Boots crunching on snow, the sharp sound slicing the quiet of the Minnesota prairie. Noses dripping. Cheeks flaming red. Fingers numbing through too thin gloves. These are my winter memories, elicited by photographing a snowman. FYI: Click here to view last year’s snowman pix. And click here to see my photos from 2014. Check back tomorrow to see another notable snowman gracing a Faribault yard just blocks from the Hoisington snowman. WHEN I FIRST READ about goats eating Christmas trees, I was skeptical. But then I watched a video on Goat Dispatch and saw for myself goats devouring these sharp-needled evergreens. This Sunday afternoon, January 24, River Bend Nature Center in Faribault will feature the Christmas tree eating goats at Winterfest. The event runs from 1 p.m. – 4 p.m.
Randy unloads our Christmas tree. Last Sunday afternoon, on one of Minnesota’s coldest winter days thus far this season, my husband and I headed across town to River Bend. The parking lot was empty as we unlatched our Charlie Brown tree from the roof of the van and Randy pulled it onto a pile of discarded holiday trees. I photographed these goats grazing in a pasture near Northfield in August 2015. They are not a part of Goat Dispatch. I remember as a child reading that goats will eat tin cans. I may have gotten that idea from The Three Billy Goats Gruff, a favorite childhood fable. Myth or truth? Probably truth. Goats graze on buckthorn at River Bend Nature Center, Minnesota Prairie Roots file photo October 2014. Goat Dispatch, a rural Faribault business that rents out goats for land management/brush removal grazing, states online that goats have narrow strong mouths. I would expect that given Goat Dispatch goats have attacked invasive buckthorn at River Bend. I’m quite familiar with the sharp thorns of buckthorn. This sign was posted on a fence enclosing Goat Dispatch goats at River Bend. Minnesota Prairie Roots file photo October 2014. And I personally know Goat Dispatch owners Jake and Amanda Langeslag. This young couple is about as down-to-earth friendly and honest as they come. They are passionate about the environment and their goats and their business. If they say goats eat Christmas trees—and they show that in a video—I believe them. Dairy Delite in Lakeville, photographed on a frigid Saturday afternoon in January. IF I WAS TO CONDUCT a survey on Minnesotans’ consumption of ice cream, I expect the numbers would plummet in months like January and soar during the hot days of July. Makes sense considering the temperature. My desire for ice cream drops considerably in winter. I’m cold enough without feeding more cold into my body. But not always. Just the other night I craved not ice cream, but fro yo. I remember when my eldest daughter first mentioned fro yo probably five-plus years ago. The frozen treat was just trending in southern Minnesota. I had no idea what she was talking about. Eventually fro yo reached Faribault with the opening of Berry Blast in 2013. The business recently closed. I never got there. In Faribault, Dairy Queen reigns with two shops within a short distance of one another. I like Dairy Queen. But if I get a treat there once a year, that’s about it. And then it’s only if I have a coupon to discount the high prices. I’ve never been a chain restaurant fan. I much prefer locally-grown businesses with character, uniqueness and charm. Like the Dairy Delite, recently photographed in Lakeville. It’s closed for the season, has been since October, and will reopen in April. Tell me about your favorite original ice cream shop.